Basic sound timbers and a solid base coat are essential. 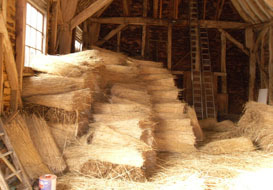 All timbers are inspected by us and any unsound rafters/battens and even wall plates are replaced or repaired. Any loose or unstable brickwork will be repaired before commencement of thatching. We always use the best quality materials, locally sourced when available. 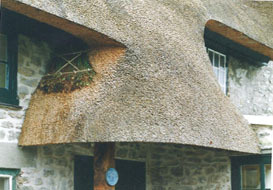 The depth of thatch is crucial to the longevity of the roof. The depth on our roofs is always a minimum of 30cm (twelve inches). A block ridge, as opposed to a flush ridge, is always applied by us as it prolongs the longevity of the roof by keeping the apex dry. 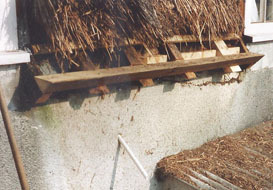 Inspection of the pointing, both above and below the thatch line, together with the rendering below the thatch line, is vital to ensure that the chimney structure is safe and does not pose a fire hazard. Lead flashings are applied by us to all sides of the chimney where necessary. We take great pride in the way we fit the wire to the roof - every piece has to be neatly fastened with no ugly overlaps. We take great pride in keeping the workplace tidy at all times. After completion of the work the area surrounding the property is always cleaned thoroughly. Amesbury, Larkhill, Idmiston, Fordingbridge, Downton, Warminster. Westbury, Wilton, Shaftsbury, Mere, Blandford, Verwood, Ringwood, Romsey, Stockbridge, Andover, Ludgershall, Totton, Shrewton, Pewsey, Devizes, Sturminster Newton, Stalbridge, Gillingham, Wincanton, Redlynch, Hale, Alderbury, Whiteparish, Odstock, Teffont, Bowerchalke, Nomansland, Landford, West Wellow, Durringon, Brook, Cadnam.